That could very well be the Global Shipping you're looking at? The GSP is a great easy way to sell and ship world wide for the seller, but the buyers in countries outside the US will Take it in the rear on shipping as EBAY will only ship the item International Priority, with ins, and it also includes any other charges: Import Duties and such. They do this to make it easy on the US shippers and to fill their own pockets. The only thing good about it is that they will protect the seller against basically anything but at the buyers expense. If not, then it might be the most expensive choice that can be made, such as "Overnight" Depending on which shipping method the seller setup first, would be the one that shows. Sometimes check the Shipping Tab for other shipping options. And sometimes the seller just gets greedy, at which point you need to turn that auction/seller over to eBay and point out outrageous shipping charges. Last edited by Allen H.; 20th Sep 2015 at 06:45 PM. At this price... I could ship to the moon! Price calculated from Vincennes, Indiana to Montreal, Quebec!!! Maybe they are shipping from Indiana via taxi. That's great for me, so can you find a AC condenser fan for a 2002 Mitsubishi Magna? I need one for my '03 Diamante. DEADPOOL 4 EL PRESIDENTÉ 2016!! Yes, that is the correct tender for that diesel. Reposting - Following this guy since Sep 2012 asking price at the time $795, Now 3yrs and 2 months later, having dropped his price in 2014 to $495. You have to admit that Big Dave is tough as nails. Three cheers for Dave. Hang in there Dave. well, road names match, price is pretty cheap so it's almost tempting! He's got another for $23, must have been a typo. This is why you have to be careful where you put the decimal point! I was digging for some decoder info tonight and ran across this. Not today Skippy, not when I can pickup an up to date version for $9.01 cheaper and free shipping! $9.39 Standard Shipping -- Really?? I'm surprised they didn't add "RARE"
Sellars like this gives the entire ebay community a bad name. I was looking today for European trams. 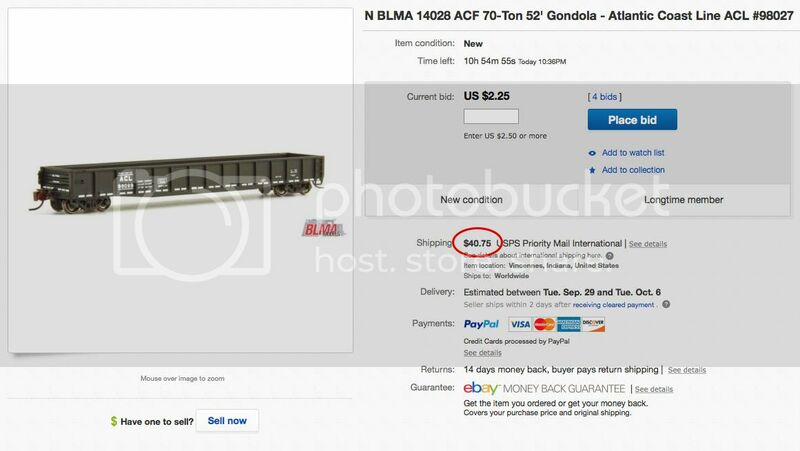 I saw the same tram set up for $60 auction used and up to $450 new. MSRP new is around $140 if they were still available. Luckily I found what I really wanted much cheaper somewhere else. "cause the monkey's got the locomotive under control." I'd gladly sell the two that I have together for that price!